We just got a new member to our family. Kain is a Eastern German Shepherd. Kain has a new older sister Maggie who is a Golden Retriever. 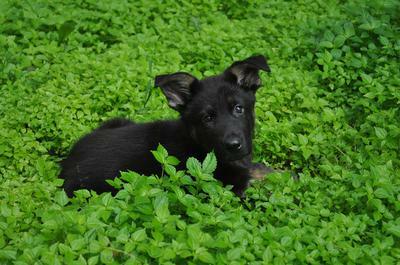 Thanks so much for sending in the great picture of your German Shepherd Puppy Kain. He is such a cutie - and the picture of him sitting against the green grasses is very stunning. Nicely done. I hope he gets along well with his new big sister Maggie and the rest of the family too. I am sure that you all love him to death. I wish you nothing but the best with him in the future. And maybe somewhere down the road you can send us in an update letting us know how he's doing. We always love hearing lots of German Shepherd Puppy stories and I can think of nothing love to look at more that cute German Shepherd Puppy photos! Purchased a puppie from Sheila and Peter. The pup got sick within 24 hours of purchase, and at 36 hours we brought him to our vet. The pup had a lump on his right rear elbow that I thought was torn muscle. Turns out it was a congenital bone deformation that nobody picked up on. I informed the Vom Benza Haus and they mocked me! Initially I thought the pup had Parvo because of the way he was acting...not eating, lethargic, loose stool, dry heaves, fever, etc. I then described the hard mass on his rear leg and I got laughed at again! SO COCKY! Well, I WAS RIGHT! Then they wanted the pup back immediately! I returned the pup, and got their last male...or so they said. I also asked them to foot the bill for the vets...$321.00...oh yeah..."We Won't Stiff Ya!" Well, they did. We've tried several times to contact Sheila and Peter and of course they're not answering! Looks like we're stuck with the bill! DO NOT BUY A PUPPIE FROM THESE PEOPLE...VERY STRANGE! DISHONEST! CONDESCENDING! Congratulations on your new edition to the your family! Kain is a Beautiful German Shepherd puppy! You have long years of joy with her. You will how found out how Wonderful German Shepherds are; they are so Amazing. Kain will start demonstrating her protectness before she is one year old. Good luck and take her of your girl and she will take care of you! Join in and write your own page! It's easy to do. How? Simply click here to return to GSD puppy Pics.